International Night, March 22: All Welcome! 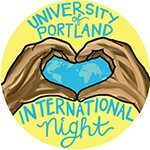 The University of Portland will celebrate its annual International Night in support of continuing Diversity Dialogues on Friday, March 22, beginning at 5 p.m., in the Bauccio Commons. The annual event is a night for the campus and community to come together and celebrate everything that international cultures contribute to the world. The event is free and open to the public and will start off with a student hosted Showcase of Cultures highlighting various countries and cultures from around the world. Student and professional musicians including Kalabharathi, Trio Tsuica, and Mariachi Viva Mexico will begin at 6 p.m. During the night, international cuisine will be served a la carte. There will also be free henna body art, family activities, and a photo booth for participants to enjoy. Please see the ISS website for additional event details, or contact them at iss@up.edu.